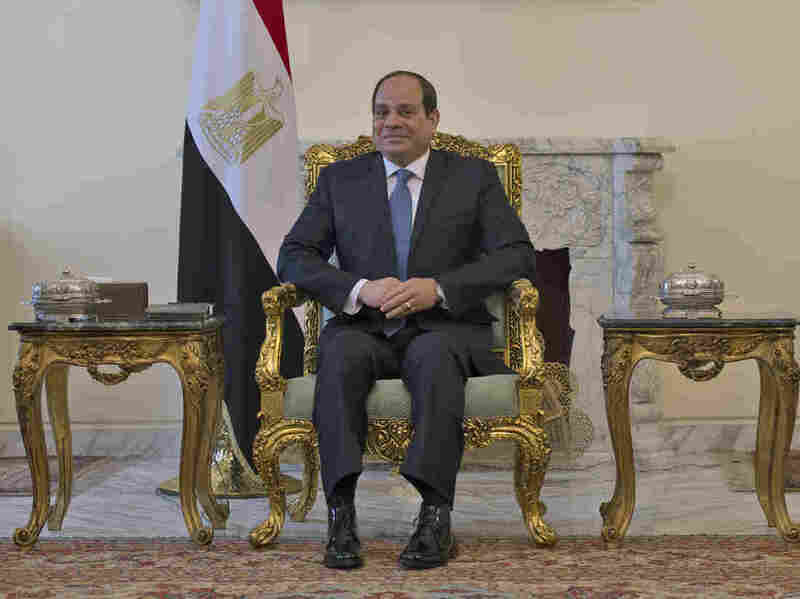 Egypt's Parliament Approves Changes That Could Extend El-Sissi's Presidency The parliament overwhelmingly approved the changes, which require a referendum to enter into force. Human rights groups are expressing alarm, saying they "sanction lifelong presidency." Egyptian President Abdel-Fattah el-Sissi, shown here in January in Cairo, could stay in office until 2034 if constitutional amendments approved by parliament pass a popular referendum. Egypt's parliament, which has 596 members, saw 485 votes in favor of the changes. The body is largely made up of supporters of the president. According to The Associated Press, the amendments will be submitted to a committee to finalize the language, then parliament will vote again. Egyptian human rights groups are expressing alarm. Eleven groups signed a statement saying that the amendments "effectively serve to destroy the constitutional separation of powers, concentrating all authority into the president's hands and solidifying his authoritarian rule." In 2013, then-Defense Minister El-Sissi led a coup against Egypt's first democratically elected president, Mohammed Morsi, following mass popular protests against him. Morsi, who hails from the Muslim Brotherhood, was in office for one polarizing year. Since then, el-Sissi has launched an unprecedented crackdown on dissent, and rights groups say he has jailed tens of thousands of his political opponents (though he denies that Egypt has any political prisoners). He was elected to a second term in 2018, in a race where "six potential candidates were either jailed or dropped out," as NPR's Jane Arraf reported. According to Egypt's constitution, passed in 2014 after the coup, this term should be his last. "The President of the Republic shall be elected for a period of four calendar years," the constitution currently reads. "The President may only be reelected once." A proposed amendment lengthens the presidential term from four to six years, while keeping the two-term limit in place. However, there's a special "transitional article" for the current president. According to a translation from the independent newspaper Mada Masr, it will allow him "to run for election for two additional terms when the current term is concluded." As the AP notes, "El-Sissi, who has repeatedly said he won't stay in office any longer than the people want him to, has claimed he opposes changing the term limits." He hasn't publicly discussed the specifics of these amendments, according to the wire service. The amendments would also strengthen the president's power over the judiciary. For example, it would allow him to appoint the head of the Supreme Constitutional Court, the prosecutor general, and other senior position. Proponents of the changes say they are necessary for Egypt's stability. According to Mada Masr, earlier this month as the proposed amendments were submitted, parliamentary speaker Ali Abdel Aal said: "We are not restricting any of the freedoms guaranteed by the Constitution, and we are not touching the principle of equality between Egyptians in regards to rights and obligations. ...These amendments serve the Egyptian people and the higher interests of the state." But for opponents, such as the human rights groups, it's another nail in the coffin for Egyptian hopes for democracy following the 2011 ouster of dictator Hosni Mubarak. "Not only do these individually-tailored provisions flout fundamental legal precepts, they also upend the peaceful rotation of power championed by the Egyptian people in 2011 to prevent another decades-long dictatorial rule similar to that of former President Hosni Mubarak, toppled after 30 years in power," the groups said.